The World Biennial Forum is a gathering of biennial practitioners and appreciators to examine and discuss the foremost topics and concerns within international biennial making and contemporary arts. The World Biennial Forum’s role is to signal primary concerns in biennial art environments, investigating and researching the various modes of operation and production in different regions, and offering insights into the current issues and needs surrounding art biennials worldwide. The Forum’s practice is to work as a partnership, hosted first by the Gwangju Biennale in South Korea: World Biennial Forum No 1, ‘Shifting Gravity’, 2012. The World Biennial Forum No 2 will be organized in close collaboration with the Fundação Bienal de São Paulo and ICCo – Instituto de Cultura Contemporânea. The World Biennial Forum No 2 is a 5-day event, scheduled to take place from November 26 – 30, 2014, during the exhibition period of the 31st Bienal de São Paulo. The World Biennial Forum No 2 will take place alongside the 31st Bienal de São Paulo. Exhibition period: 06 September – 07 December, 2014. Preview days: 02 – 05 September, 2014. The 31st edition of the Bienal de São Paulo is curated by the curatorial team Charles Esche, Galit Eilat, Nuria Enguita Mayo, Pablo Lafuente, Luiza Proença, Oren Sagiv, and Benjamin Seroussi. Focused on the iconic biennial pavilion, the event investigates art as a means to encounter experiences and emotions that are not present in most analyses of human life. Transformation, entanglement and displacement will be core concerns in selecting international artworks and organising events. If individuals or groups within a society can recognise, through art, the things that they cannot acknowledge through other means, then they might be empowered to transform themselves in unpredictable ways. The hope of the 31st Bienal de São Paulo is that it can conjure up possibilities that do not yet exist through artistic acts of will. Perhaps this is, in the end, the core function of art both historically and today. The World Biennial Forum No 2 will be held at the Auditório Ibirapuera, situated in the Parque do Ibirapuera in São Paulo. 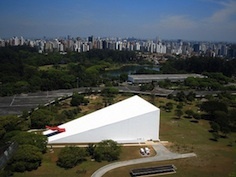 The Auditório Ibirapuera is positioned opposite the Ciccillo Matarazzo pavilion of the Bienal de São Paulo. Both the Ciccillo Matarazzo pavilion and the Auditório Ibirapuera are designed by Oscar Niemeyer. The Auditório Ibirapuera is a building conceived by Oscar Niemeyer, situated in Ibirapuera Park in São Paulo. The Ibirapuera Park was constructed between 1951 and 1954 in commemoration of the fourth centennial founding of the city of São Paulo. Designed by Oscar Niemeyer and Roberto Burle Marx, the Ibirapuera Park was built to advance Brazil’s production of modern architecture in the southern hemisphere. Oscar Niemeyer conceived the park as a planar landscape punctuated by eight pavilions, three lakes and diverse circulation paths. The park complex contains several buildings, most of them designed by Niemeyer, including the Grande Marquise, location of the MAM – Museu de Arte Moderna, and the Cicillo Matarazzo Pavilion, home for the Bienal de São Paulo. The Ibirapuera Park is one of Latin America largest city parks. Oscar Niemeyer (1907-2012) was a Brazilian architect who is considered to be one of the key figures in the development of modern architecture. Niemeyer is best known for his design of civic buildings for Brasília, a planned city that became Brazil’s capital in 1960, as well as his collaboration with other architects on the United Nations Headquarters in New York City. His exploration of the aesthetic possibilities of reinforced concrete was highly influential in the late 20th and early 21st centuries. Niemeyer died in Rio de Janeiro at the age of 104. Charles Esche, Galit Eilat, Nuria Enguita Mayo, Pablo Lafuente, Luiza Proença, Oren Sagiv, and Benjamin Seroussi are developing the program of the World Biennial Forum No 2. Charles Esche is Director of the Van Abbemuseum, located in Eindhoven, the Netherlands, where he works alongside the writer and curator Galit Eilat. Esche headed the curatorship of such important international exhibitions as the 9th Istanbul Biennial (Turkey, 2005), and the 2nd and 3rd editions of the Riwaq Biennial (Palestine, 2009 and 2007). As co-director of the London Afterall Journal and Books, he works alongside the curator and writer Pablo Lafuente and the historian and curator Nuria Enguita Mayo. The architect Oren Sagiv is in charge of the 31st Bienal de São Paulo exhibition’s expography. Biennial Foundation is an independent non-profit organization founded in the Netherlands (2009) to create a spirit of solidarity among biennials worldwide, and to facilitate a diversity of platforms for the exchange of information and expertise. The World Biennial Forum is Biennial Foundation’s most important activity. Fundação Bienal São Paulo The Bienal de São Paulo (1951) is the second oldest contemporary art biennial after the Venice Biennial. Since 1957, the Bienal de São Paulo has been held in the Ciccillo Matarazzo pavilion in the Parque do Ibirapuera, designed by Oscar Niemeyer. The Bienal de São Paulo is considered to be the most important art exhibit in Brazil and its impact on the development of Brazilian visual arts is notably recognized. ICCo – Instituto de Cultura Contemporânea is a Civil Society Organization of Public Interest (OSCIP). As a nonprofit organization its goal is to identify opportunities and to fill gaps within the Brazilian artistic environment, valuing experimentation in visual arts and offering new models of procedure. 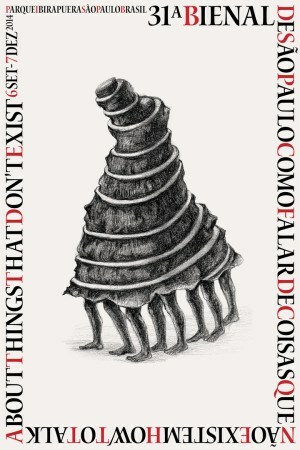 ICCo’s main action strategies are: internationalization, by promoting Brazilian contemporary art outside the country; shared management, creating partnerships with other institutes in Brazil and abroad; and revisiting aspects of Brazilian art history by connecting them with the current production. ifa – Institute for Foreign Cultural Relations is Germany’s leading organization for international cultural exchange. ifa operates both nationally and worldwide to promote the artistic exchange and dialogue between civil societies, and to provide information about foreign cultural policy. Through its biennial and exhibition funding ifa supports artists presenting their works at international art biennials. Furthermore, ifa perceives itself as a competence centre for the scientific examination of the topic biennials. Alongside publications dealing with the major art biennials, since 2000, ifa organizes the conference series “Biennials in Dialogue”, discussing matters of current interest. The Prince Claus Fund is offering ticket grants for art professionals interested in participating in World Biennial Forum No 2. The Ticket Fund is specifically intended for artists and cultural practitioners living in Latin America, Asia, Africa, the Caribbean, non-EU Balkans and non-EU Eastern Europe. Applications need to be sent in 8 weeks before the departure date. The Ticket Fund does not include accommodation, visa or per diem costs.